A U.S. Navy aircraft carrier strike group has begun "routine operations" in the South China Sea. The operations came despite a warning from China not to interfere with Chinese sovereignty in the area. The U.S. Navy announced the operations on Saturday. The strike group includes Nimitz-class aircraft carrier USS Carl Vinson. The Navy Times reported last week on the planned operations with information provided by unnamed Navy officials. The report clearly angered China’s foreign ministry. A foreign ministry spokesman urged U.S. officials “not to take any actions that challenge China's sovereignty and security." China claims the man-made islands are part of its territory, along with many other parts of the South China Sea. Satellite images suggest China has added military weapons to some of the islands. Other countries with territorial claims in the sea are the Philippines, Vietnam, Taiwan, Malaysia and Brunei. Freedom of navigation operation, or FONOP, is meant to show military force and free movement of shipping in international waters. But the operation represents a test to countries holding territorial claims in disputed areas. In the past, China has sent military airplanes and/or ships to follow American ships taking part in freedom of navigation exercises. The U.S. government defends the operations, saying they fully comply with international law. During a recent visit to East Asia, Defense Secretary Jim Mattis said the U.S. military was prepared to hold future freedom of navigation operations in the South China Sea. Zack Cooper is with the Center for Strategic and International Studies, or CSIS, a research group based in Washington, D.C. He says international law is clearly described in the United Nations Convention on the Law of the Sea. 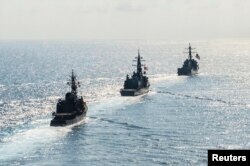 Arleigh Burke-class guided-missile destroyer USS Mustin (DDG 89) transits in formation with Japan Maritime Self-Defense Force ships JS Kirisame (DD 104) and JS Asayuki (DD 132) during bilateral training in South China Sea on April 21, 2015.
Cooper has been watching new U.S. President Donald Trump. He thinks the new U.S. administration is likely to take a more assertive position to freedom of navigation operations in the South China Sea. Cooper added that the next test for China’s government could be in waters near Mischief Reef, in the Spratly Islands. China has been expanding that man-made island for years and has reportedly built extensive military positions on the reef. U.S. freedom of navigation operations can send an important message to any state testing international maritime law, he added. Still, Cooper said, it is not likely that freedom of navigation operations will stop Chinese militarization or existing projects in the South China Sea. But he said it could prevent China from claiming and developing new territory. Cooper said the revision suggests the law would give China the power to declare control over foreign ships passing through the South China Sea and other major waterways. He said other nations should send a strong message to China that they would oppose such changes. Bryan Lynn reported this story for VOA Learning English. His report includes information from Reuters, the Associated Press, Navy Times and other sources. George Grow was the editor.